Turbulence in Congo - Air Serv International, Inc.
“If we’re lucky, we’ll actually see the volcanoes today,” Cindy Silong says as we make our way through the murky gray skies of southeastern Uganda. Frankly, I’ll consider myself lucky if I see anything clearly today. There’s an overcast just above us, and we’re flying in and out of rain showers, with visibility that rivals that of Los Angeles on what even Angelinos would classify as a “marginal” day. “You’ll want to keep on that course line,” Cindy says, pointing to the GPS as we approach the mountainous border between Uganda and the Democratic Republic of the Congo (DRC). “Seriously. I mean ON that course line,” she emphasizes again. I’m only one dot off course, but I nudge the Caravan a little bit to the right. The reason for her stricture soon appears off to my left, rising out of the mist and clouds like a dark iceberg looming above the gray-green waters of the North Atlantic. The peak is Volcan Karisimbi, a 14,787-foot tall volcano that’s the tallest of eight volcanic peaks along the Uganda-Rwanda-Congo border, where some of the world’s most spectacular gorillas-and violent rebel soldiers-take refuge in the dense jungle foliage. To get to our destination of Goma, we have to make our way past at least five of these towering peaks, culminating in a “thread-the-needle” approach into Goma between two closely spaced volcanoes less than 10 kilometers from the airport. As we near our aptly-named “Volk 1” approach waypoint on the GPS, the clouds part and two staggeringly impressive peaks appear in front of us. Only a few kilometers separate their slopes, and the pass between them is almost 7,000 feet high. We’re at 10,500 feet-a compromise between the descent required for the fast-approaching airport and the altitude required for terrain clearance-but the peaks to either side of us stretch up to 11,384 and 14,557 feet, respectively. I tell Cindy I understand her concern about course deviation. Obviously, I’m flying with a woman who possesses more than the average zest for challenge, stress and risk. Which might explain why she’s thrived here, flying in Uganda and Congo for the past three years. Ten minutes later, we’re on the ground in Goma. Twenty years ago, my sister Gail lived in Congo (then called Zaire) with the Peace Corps, and she remembers Goma as a beautiful and lush garden spot that was a popular vacation destination. It still is a stunningly beautiful area, tucked in between the northern shores of Lake Kivu and the mountainous Rwandan border. But it’s also directly in the path and shadow of two active volcanoes, and the region itself is now as unstable as the turbulent and periodically destructive forces that flow beneath it. Which is, of course, why we’re here. 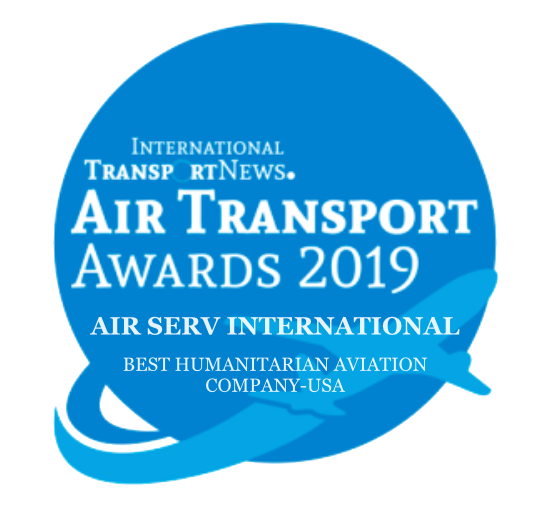 I’m in Congo with Air Serv International, which provides air support for humanitarian organizations in disaster and conflict zones around the world (Refugees and Legionnaires, February 2008). And after years of civil and regional conflict sparked by the Rwandan genocide of 1994, two volcano eruptions, staggering levels of atrocities against women by undisciplined militias, and two cholera epidemics, eastern Congo definitely qualifies as a disaster and conflict zone. So Goma is now a major hub of international aid organizations, many of whom need air support to get personnel and supplies safely to outlying villages. The Air Serv pilots in Goma have more comforts than in some other places. The crew house sits on the shores of Lake Kivu, with bougainvillea cascading over its brick walls. There’s a guarded gate to the compound and power only half the time, but pilots in Goma at least have some restaurants and bars to socialize in and a community of young aid workers to socialize with. On the other hand, flying in the Congo is still a challenging and hazardous endeavor. Air Serv pays strict attention to maintenance, enforces very conservative operating procedures and standards, and consequently has an excellent safety record. But four days before I was scheduled to fly to the Congo, the airplane I was supposed to fly there crashed in the jungle. Miraculously, its pilots survived relatively unscathed, but it was a sobering reminder about the hazards of flying in remote Africa. ?The accident rate in Africa is 13 times that of the rest of the world for transport aircraft,? Air Serv?s international chief pilot Mike Ventre tells me. Part of that statistic is due to what Ventre calls ?normalization of deviance.? Fly IFR through a volcano gauntlet, fly blind into unknown weather or land on a runway shortened by obstacles or flooding enough times, and the risk attached to it begins to feel normal. So the bar of ?unacceptable risk? gets raised. For example, pilots in the region still talk about a spectacular crash that happened in northwestern Kenya a few years ago. A Hawker 748 cargo plane coming into the Lokichoggio Airport there landed gear up. The plane stopped about one-third of the way down the airport?s only runway, causing other inbound planes to divert to distant alternates. But a C-130 crew, accustomed to landing on difficult, short and obstructed runways, decided they?d simply land in the opposite direction, on the remaining portion of the runway. They aimed for the numbers ? and miscalculated. They hit short, wiping out the 130?s gear and sending the Hercules careening sideways down the runway. The crowd around the Hawker scattered wildly as the C-130 came screeching toward them and crashed headlong into the already disabled 748. But the other reason for that statistic is simply the conditions in Africa?no radar or weather assistance, hostile terrain and marginal airstrips. On my first day of Caravan flying in Congo, we flew into one strip that?s actually just a curved stretch of paved mining road through the jungle. The road is a whopping 20 feet wide, with ditches on either side, and the runway threshold is marked by two wrecked Antonov An-2 cargo planes?graphic reminders of the fate that awaits any pilot who doesn?t land precisely on the center of the pavement. But in Congo, the risks go beyond the mere physical. ?In terms of day-to-day difficulty, Congo is the worst of any place in Africa we fly,? Ventre says. ?Because the challenges you face as a pilot increase when you shut the engine down. Things are unstable and change very quickly,? he cautions. ?And because of that, and people not knowing if they?ll be around tomorrow, whoever?s in charge takes what they can get today. And we?re a target, because we operate expensive aircraft.? In short, it?s hazardous country. And the combined risks of the Congo start closing in on us, even while I?m there. When I arrive, the powerful rebel commander Laurent Nkunda has moved his forces to Sake, a town 15 kilometers outside of Goma. The Congolese government, meanwhile, is flying in troops and ammunition daily to keep the rebels from taking Goma. When we land, we can hear artillery fire in the distant hills. There?s a contingent of United Nations peacekeepers stationed in Sake to keep the two sides apart and enforce Congo?s formal peace agreement. But on Thursday night, word comes that the UN forces at Sake have been forced to retreat, Nkunda is advancing, and some UN vehicles in Goma have been attacked. Humanitarian organizations impose curfews on their workers, and there?s talk of evacuation. The Air Serv pilots are calm, but I can?t help wondering if they really know that there?s no cause for alarm, or if this is another case of ?normalized deviance.? Even in my short time here, I?ve realized that you can get so used to guns and soldiers that the possibility of conflict begins to seem normal. But at least we have airplanes and know how to fly them. That?s a comforting thought. On Friday, there are more government soldiers in the streets and at the airport, many of them with rocket-propelled grenade launchers slung over their shoulders. The two Air Serv pilots who were involved in the jungle accident, meanwhile, spend the day awaiting word on their fate from local authorities investigating the crash. Mike Ventre?s cautions about the unpredictability of both local officials and the overall security in Congo begin to seem uncomfortably prescient. On Saturday morning, Cindy and I are up at dawn for a Caravan mission. As we ride out to the airport, we see white UN tanks and armored vehicles headed down the road in the opposite direction, followed by truckloads of blue-helmeted UN soldiers, all heading toward Sake. I shoot a quick glance at Cindy. ?So, are tanks normal around here?? I ask sharply. Cindy frowns and shakes her head. Even she now looks concerned. ?No. We?ve known they had them, but I?ve never seen them before,? she says. We take off and fly to Punia, where we have a short pow-wow with Air Serv?s chief pilot in the Congo. He?s been told that the pilots who were in the crash can leave the country, but it?s uncertain how sure or lasting that permission will be. He tells Cindy he wants her to fly them to Uganda immediately. We head back for Goma. As we near the town, Cindy points off to our left, where a blockade of square, white objects is clearly visible on the road between Sake and Goma. ?I?m thinking those are the UN tanks,? she says, ?but we?re not going any closer to verify that.? At Goma, Cindy cautions a local Air Serv worker to hold off filing our flight plan and manifest until we return to the airport. No sense giving the officials any more notice than necessary of our plans, or who we’ll have on board. Just in case. An hour and a half later we return with the two pilots and load up to go. But somehow, there’s been a miscommunication or cross-cultural broadside to Cindy’s instructions. Our flight plan was filed as soon as we left the airport. “What do we DO?” I ask Cindy in dismay. The airport is crawling with armed government soldiers. Stopping us is going to be easy. Cindy shrugs. “Well, we’ll just see how far we get,” she says. We climb into the Caravan’s cockpit and call for permission to start the engine, glancing uneasily at each other while we await the answer. We’re cleared to start. That’s one hurdle crossed. Two minutes later, we call for permission to taxi, sweating through another interminable silence before approval is granted. That’s two. We taxi with trepidation between airplanes and soldiers, passing right under the control tower’s windows en route to the runway. At the hold short point, we call for clearance to take off. Again, the wait. My heart is pounding. Any second, I expect to hear the shouts, see the soldiers running and hear the order to cut the engine. Cindy and I shoot each other another look. After what seems like an eternity, the radio crackles. We have permission to leave. “Let’s get out of here,” Cindy says as she puts the throttle forward. Now all we have to do is navigate through the volcanoes-on instruments. But suddenly that doesn’t seem so bad. A few days later, I’m at the international airport in Accra, Ghana, looking at a beautiful Delta Airlines 767 whose next stop is John F. Kennedy airport in New York. It’s been a long time since I’ve appreciated seeing a piece of America-or the prospect of a direct, nonstop airline flight-quite so much. The mere fact that Delta now offers direct service to Ghana, Senegal and South Africa-the first American carrier to provide direct service to Africa since the days of Pan Am-says a lot about how far Africa has developed as a business and tourist destination. But taken as a whole, it’s still an untamed continent, with vast stretches of inaccessible land and a paucity of reliable roads and infrastructure. Not to mention a breathtaking amount of conflict, violence and poverty. And yet … I understand why pilots love flying in Africa. Yes, there’s danger, discomfort and risk, and the poverty and violence can be exhausting to even witness, let alone confront. We have no idea how safe and comfortable we truly are here. Even in the course of a month, I found myself newly appreciative of things I should be grateful for every day but too often take for granted. And while most of those items involve basics like safety, money, running water, health, civil rights and peace, they also include the simple luxuries of paved, straight runways more than 1,500 feet long and the wonders of weather forecasting and flight service support a mere reliable phone line away. But to fly in places where people’s survival depends on your actions is profoundly rewarding. And in terms of educational adventure, Africa is hard to top. Even as difficult as some of my time there was, I’d still go back. For there are few untamed places left in the world. And Africa is like all wild and untamed things-vivid, stark, beautiful, dangerous, challenging, unpredictable, uncomfortable, breathtaking … and utterly unforgettable. For more information, go to airserv.org.